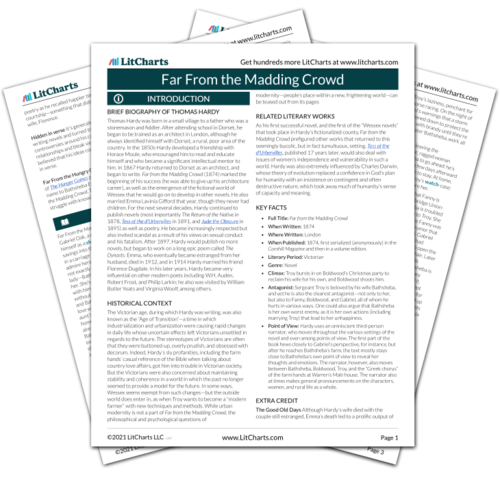 LitCharts assigns a color and icon to each theme in Far From the Madding Crowd, which you can use to track the themes throughout the work. One of Bathsheba’s principal weaknesses is her sense of pride, which (at least initially) is linked to vanity. When Gabriel Oak catches her looking at herself in the mirror, Bathsheba is simultaneously embarrassed and comforted by knowing that he’s seen her at her worst. Bathsheba’s pride suffers a number of other setbacks over the course of the novel, setbacks which she ultimately recognizes and accepts as proper ways of atoning for her earlier mistakes. Baena, Victoria. "Far From the Madding Crowd Themes." LitCharts. LitCharts LLC, 9 Feb 2017. Web. 20 Apr 2019. Baena, Victoria. "Far From the Madding Crowd Themes." LitCharts LLC, February 9, 2017. 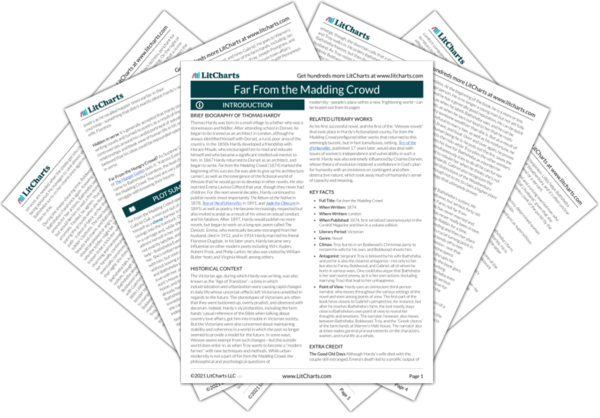 Retrieved April 20, 2019. https://www.litcharts.com/lit/far-from-the-madding-crowd/themes.